The cinema has not been kind to Ellery Queen. No theatrical film has ever depicted him with anything like his literary personality. And the plots were often wildly rewritten. Still, for the fan, there is usually something of interest in even the clumsiest effort. And there's always hope that a great film will be made about this character. During their short Hollywood stay the cousins did some uncredited work on Shadow of the Thin Man. The scene where Nick Charles finds a missing gun in a drain is pure EQ logic. Manfred Lee was heavily involved in the EQ radio series. For nine years the cousins themselves wrote many radio scripts, during a time when authors typically would license a character to the producers but take no creative role thereafter. The shows featured a challenge to the listener, and included a unique segment with one or more guest celebrity ‘armchair detectives’ who would try to deduce the solution to the mystery from the clues given on the broadcast. Ellery Queen first came to television in the medium's earliest years. Like other programs of the time, it was an attempt to capitalize on a well-known radio series, but the shows were mostly unremarkable. It was Jim Hutton's 1975 NBC series that set the standard: his was the definitive filmed portrayal of EQ. 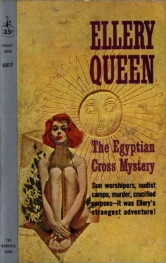 Fred Dannay said Hutton reminded him not so much of the character Ellery Queen, but rather of himself at Hutton's age. Use the sub-menus to learn more about Ellery's adventures in movies, radio, and television. Play buttons in the listings present clips from the films and tv shows.